Quickly gain the insight necessary to address a multitude of Java coding challenges using this succinct reference guide. Short, focused code examples will help you master Java elements such as modules, boxing/unboxing and more. You won’t find any technical jargon, bloated samples, drawn out history lessons or witty stories in this book. What you will find is a language reference that is concise, to the point and highly accessible. The book is packed with useful information and is a must-have for any Java programmer. 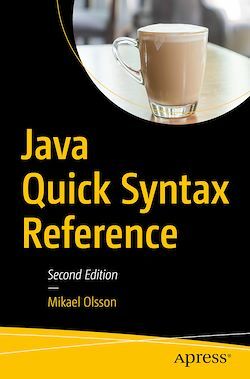 Those with prior experience with Java who want a quick and handy reference.